Steven (Chicagoland, United States) on 23 April 2018 in Plant & Nature and Portfolio. 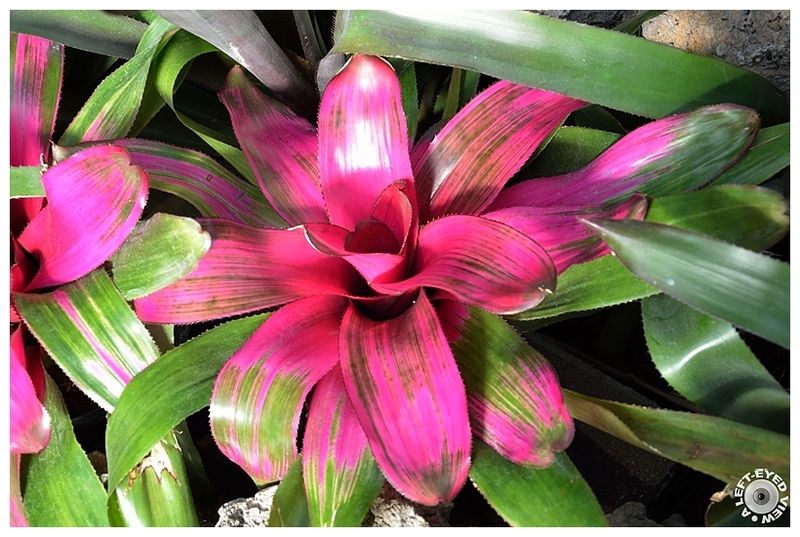 Neoregelia is the largest of any bromeliad genus and most superbly colored of all, known for their showy and diverse foliage colors and patterns. The rosettes are usually spreading and flat although some are vase shaped. The flowers barely rise above the water in the central cup. Some neoregelia species and hybrids are green when they start out as pups and almost all rely on bright light to achieve brilliant colors. In today's cultivars, the leaves are spotted, mottled, banded, albo-marginated or variegated, even when young. Sizes range from miniatures about 1 inch tall to landscape monsters over 40 inches wide. Les couleurs de cette plante sont magnifiques. I like those beautiful vivid colors. J'adore ce genre de plante qui est fleur à la fois ! Good capture of this beautiful plant. Have a nice Saint George's Day ! Gorgeous highlights here and there and nice tight framing. A pleasing eyeful. wow...this is magnificent !! Great crisp shot here ! Gorgeous colors! I find these plants to be so interesting. I have one from my dad's greenhouse. I have no idea what I am doing wrong with it but it has not bloomed in years. Lovely. It is like someone has been there with a paintbrush. I love the colors... Nice shot! Quelle jolie plante, j'aime le dégradé de couleurs. I have one of these in the garden, but I did not know her name. Now I can publish the photos I have of her, because now I know its name. However, my photos are not prettier than this. On the contrary. This photo has color, has graphics, has symmetry ... It is very well done. A captivating composition of green and purple and pink!